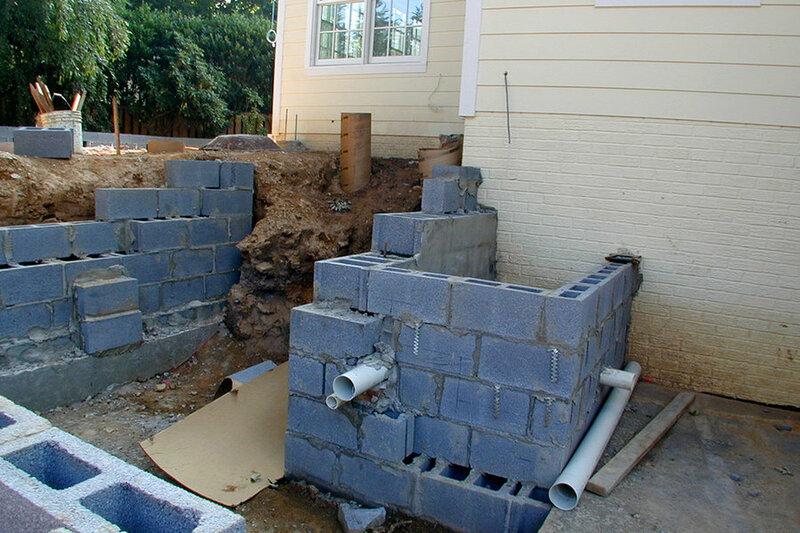 The original split-level home was gutted and almost doubled in size. 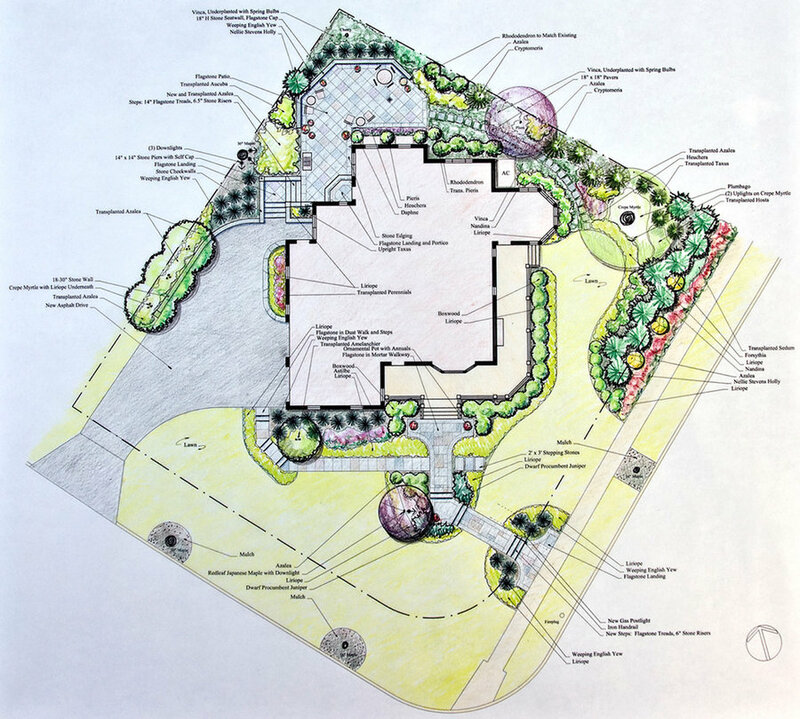 The landscape and architecture were designed simultaneously for optimal result. BELL BUILDERS were responsible for the renovation. 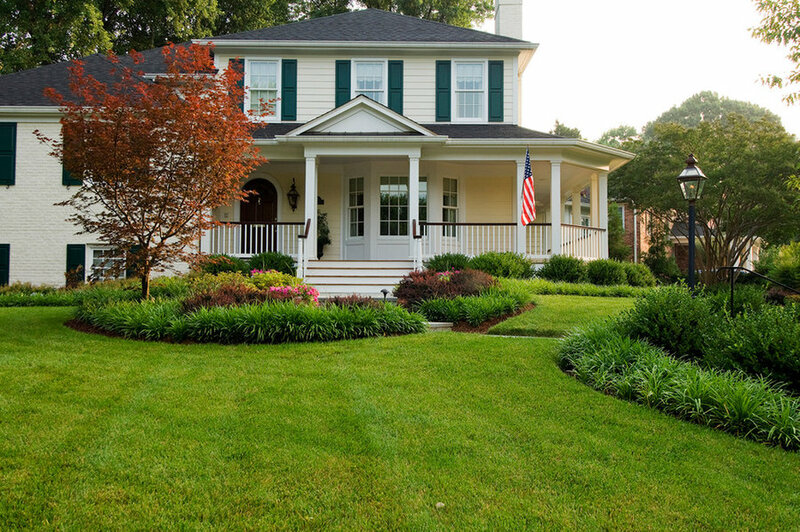 This elegant mostly-green landscape is punctuated with the purple-red tones of Bloodgood Japanese maple and Barberry. 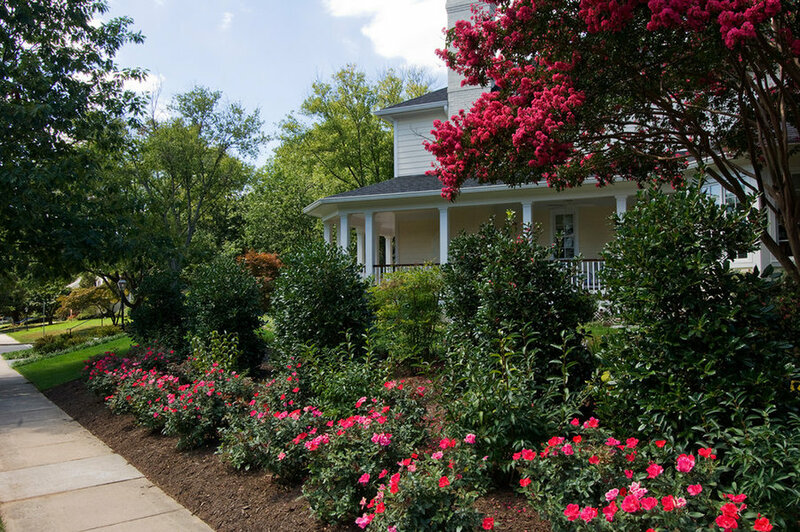 Azalea, Astilbe, Boxwood, Laurel and Liriope provide a classic plant palette. A mature CrepeMyrtle is behind the gas lamp. DESIGN: Cathy Carr, APLD Photo and installation by Garden Gate Landscaping, Inc. The landscape plan demonstrates the combination of private and public space. 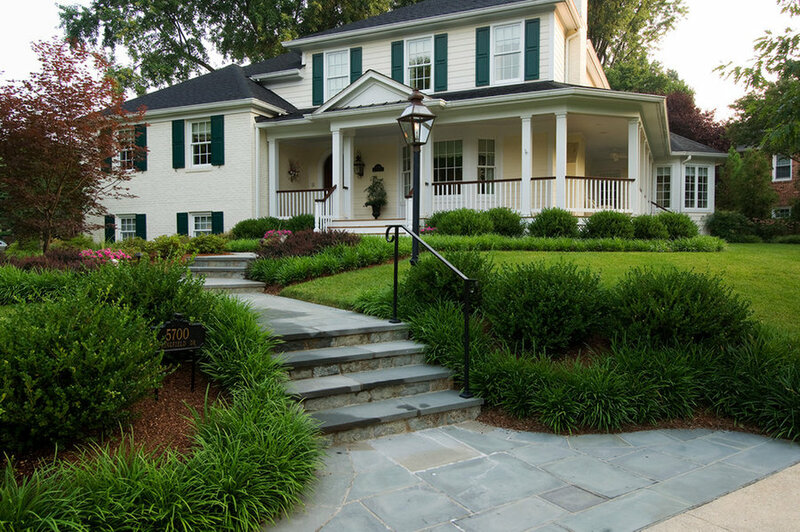 DESIGN: Cathy Carr, APLD RENDERING: Carol Gale Designs Photo by Garden Gate Landscaping, Inc. 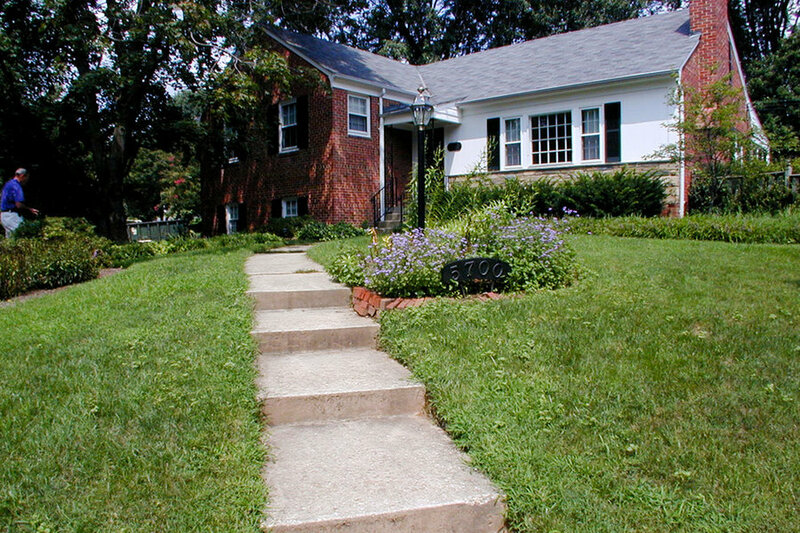 The angle of the walk and steps respects the home's street address. A gas lantern is always welcoming. DESIGN: Cathy Carr, APLD Photo and installation by Garden Gate Landscaping. 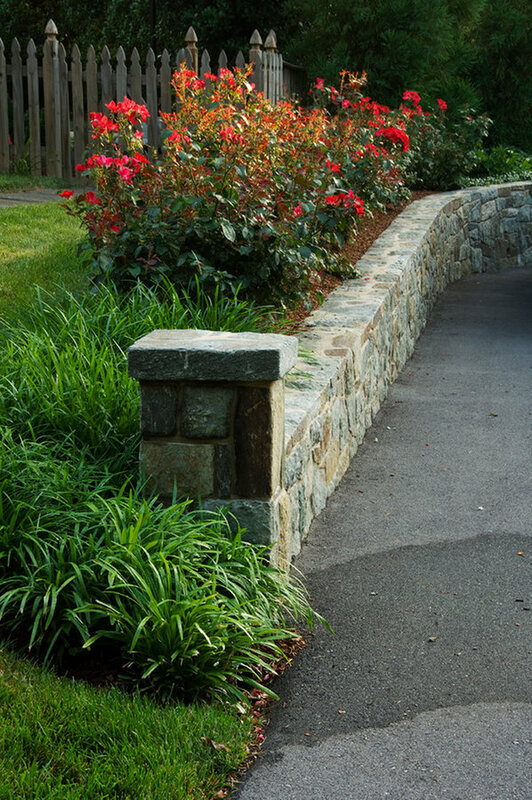 A stone wall with entry pier handles the change of elevation. 'Home Run' Roses flower more than 6 months of the year. DESIGN: Cathy Carr, APLD Photo and installation by Garden Gate Landscaping, Inc.
Construction of the upper patio and L-shaped steps required supporting piers (see Sonotubes), stone-veneered CMU walls, and attention to drainage. DESIGN and Photo by Cathy Carr, APLD Construction by Garden Gate Landscaping. 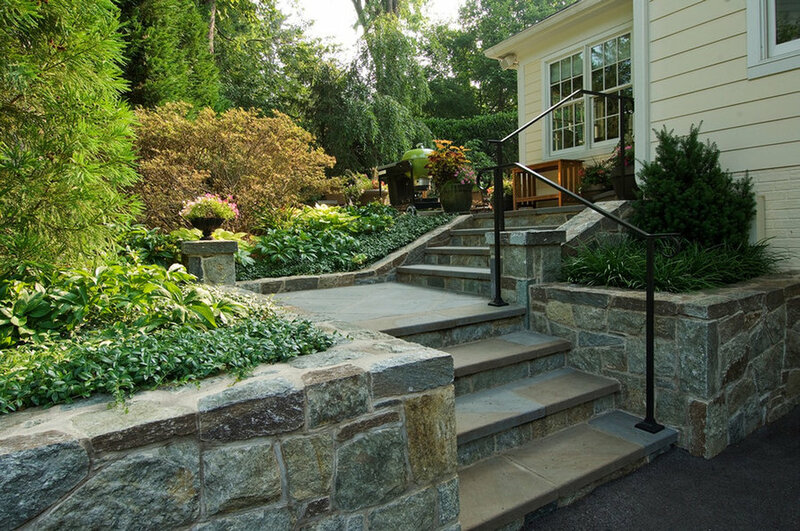 A simple iron handrail and low stone cheek walls make a journey of the walk up the steps. Vinca, Helleborus, Yew, Azalea and a weeping Cherry tree surround the upper terrace. DESIGN: Cathy Carr, APLD Photo and installation by Garden Gate Landscaping, Inc. The shape of the step and landing echo the entry roof overhead. Flagstone installed on a diagonal increases the visual feel of the space. The stone seat wall is capped with flagstone which has a thermal edge. DESIGN: Cathy Carr, APLD Photo and installation by Garden Gate Landscaping, Inc. 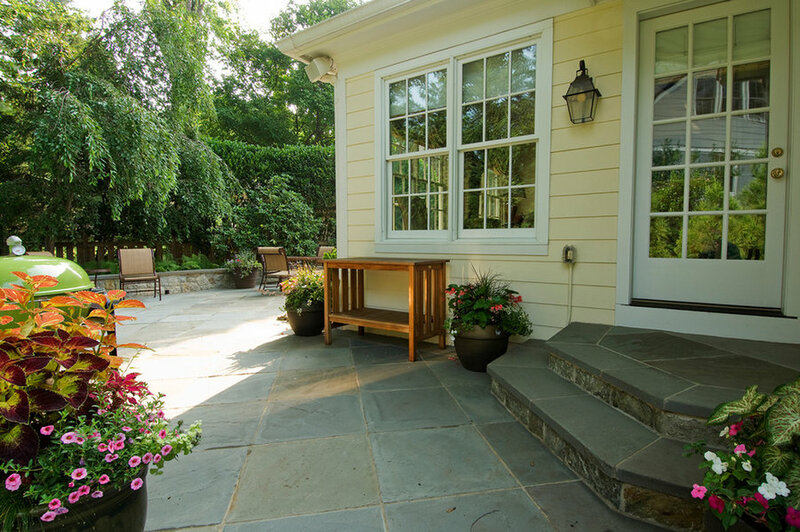 The homeowners enjoy sitting on their side porch and wanted privacy from passersby. KnockOut Roses along the sidewalk are backed by Forsythia for early spring interest and Nellie R. Stevens Hollies for behind them. From the porch, Nandinas grow in front on the Hollies while the grand Lagerstroemia creates a dark pink cloud of summer blossoms. 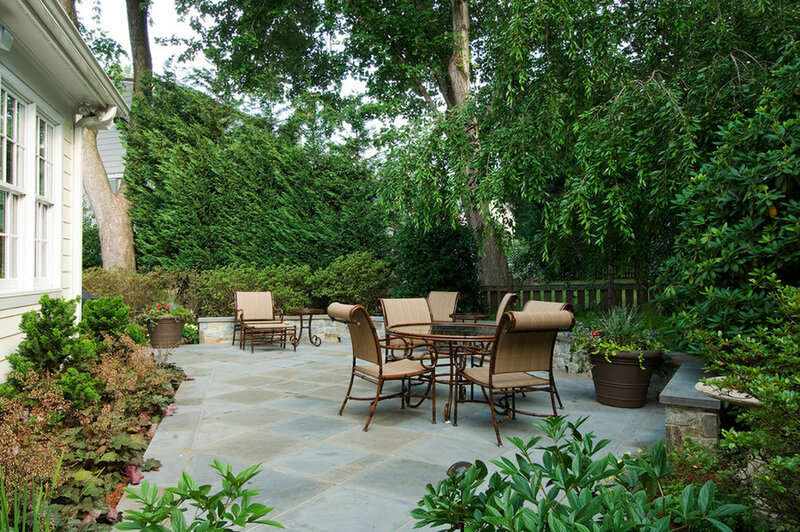 DESIGN: Cathy Carr, APLD Photo and installation: Garden Gate Landscaping, Inc.
A view of the private terrace. A stone-capped seat wall awaits a large party. DESIGN: Cathy Carr, APLD Photo and installation by Garden Gate Landscaping, Inc.